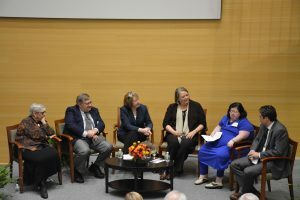 This past Monday, Oct. 23, the Heller School hosted a panel titled “JFK and Another Civil Rights Movement: People with Intellectual Disabilities” to discuss how John F. Kennedy’s administration changed public policy surrounding people with intellectual disabilities. Members of the panel also assessed what steps communities should take to further promote their inclusion. The first question was addressed to Deborah M. Spitalnik ’70. Spitalnik was the founding executive director of the Boggs Center on Developmental Disabilities and was a member and chair of the President’s Committee for People with Intellectual Disabilities. She spoke about life for people with intellectual disabilities before President Kennedy took office and the changes his administration brought about. Spitalnik emphasized Kennedy’s campaign to combat societal issues, find scientific solutions and enlist American communities in the support of people with intellectual disabilities. Spitalnik also mentioned Kennedy’s goal of addressing issues that could lead to increased instances of intellectual disability, like lack of prenatal care. Charlie Lakin, the former director of The National Institute on Disability and Rehabilitation Research, spoke about practical legal and societal changes that the U.S. has made as a result of JFK’s presidency. Lakin addressed the horrible conditions that 270,000 people with intellectual disabilities faced when sent to institutions, a choice parents were forced to make because they had no other options. He also spoke about JFK’s belief in “normalization” for people with intellectual disabilities, meaning his commitment to helping people with intellectual disabilities integrate into general society and live their lives the way everyone else does. Sue Swenson, the Assistant Secretary for Special Education and Rehabilitative Services under Obama, talked about the right of all children to education, and how the U.S. historically has been a beacon of hope as one of the only nations in the world that guarantees that right. She conceded that the U.S. has many more steps to take to ensure that people with intellectual disabilities receive the same education other students do. Swenson ended her speech by mentioning that Brandeis was formed the same year that the state of Israel was established, and that the reason the U.S. does not contribute to UNESCO anymore is because of its relationship with Israel. This event was just one in a series of events honoring the 100th anniversary of JFK’s birthday, which will take place on May 29. Eileen Mcnamara, the chair of the Journalism Program at Brandeis, moderated the panel of five. She is the author of an upcoming biography about Eunice Kennedy Shriver.